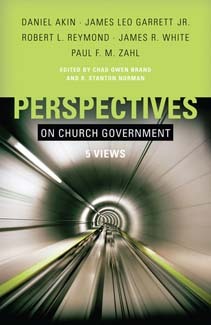 These questions are all addressed in Perspectives on Church Government: 5 Views. For the sake of space, I won’t try to summarize the individual author’s arguments; instead I’ll give a few comments on each presentation before my overall thoughts about the book. Akin admits to not believing that a church should necessarily be led by a single elder/pastor, but it appears that he was assigned to defend this topic, so he does. That being the case, he argues that the single elder/pastor model is permissible but not necessarily the ideal. Since the rest of his arguments tend to echo Garrett and especially White, this results in his chapter feeling more like an introduction. It does function as a good introduction to many of the key issues and texts, by surveying Scripture, history, and theological concerns. Unfortunately, some passages Akin uses in support of congregationalism are not persuasive unless one already holds the position he’s arguing for. Garrett seems to do a better job defending Congregationalism by being more direct and dwelling longer on fewer, stronger texts. Robert Reymond argues for the Presbyterian model, bringing the concept to Acts 15 and attempting to show that the council acted in a Presbyterian form. This was a weak argument and he was rightly criticized by the others for putting too much weight on this one inference. Reymond’s chapter felt over-long and a slog to read – it was full of large block quotes, history, and other diversions that didn’t actually contribute much to his argument. The arguments Garrett presented for congregationalism were more persuasive and to the point than Akin’s, he engaged Scripture more than Reymond and stayed on task. However, while Garrett’s position of a Congregation-led church was well argued, it didn’t feel fleshed out holistically. He didn’t consider the purpose and function of elders and how they fit in his model, which is a large oversight. I’d never heard of Paul Zahn and wasn’t particularly excited about reading his chapter since I feel his position is unprovable. However while I wasn’t persuaded in the least, his chapter was probably the most enjoyable to read! Zahn is a terrific writer and the pages turned quickly. He made great points, was fair, and even criticized his own position at times. While this chapter is entertaining and insightful, it just doesn’t fit with the others; I don’t think it belongs. Zahn’s uses virtually no Scripture to support his view because he believes the New Testament doesn’t give enough guidance on this issue to inform a decision. Before reading, I expected to be most persuaded by James White and I was correct. This is most likely because I agree with his belief that God has given us what we need in His Word to at least form the basis of church structure. White’s chapter was clear, to the point, and Biblical, and for me it presented the most persuasive argument. A few questions were left unanswered however. White argued for a higher level of authority in the eldership than Garrett and (apparently) Akin, but the issues of how elders are to be kept accountable, and who should appoint them in the first place – the congregation or other elders? – weren’t addressed. As a whole, I have mixed feelings about this book. It was informative, but uneven. My enjoyment and understanding rose and fell depending upon the author! Probably my biggest problem was that it felt as if the authors were playing by different rules, since some believe that the NT doesn’t give enough information to prove one view over the others. Some will see this diversity as a strength, because it reflects the fact that some don’t hold to their polity primarily because of Scripture. I was hoping for more text-based arguments and responses, so I think the book would have been more effective if all authors defended their view as being the most Scriptural. This would have leveled the playing field and probably would have led to more interaction with the texts that others used in their presentations. Akin, Garrett and White all presented a form of Congregationalism. One could argue that having three presentations devoted to one view is unbalanced or unnecessary. However, Garrett and White’s positions are really quite different. It was good to see different models of Congregationalism explained. In contrast, Akin’s wasn’t particularly unique from either of theirs, especially considering he argued for a permissible model, rather than one he saw as best or even beneficial. His chapter felt fairly superfluous, despite being very good in its own right. A few of the authors took pot shots at non-denominational churches and/or mega-churches and their (supposed lack of) polity. Since I attend Calvary Chapel, I was a bit defensive to the charge of such churches not taking polity seriously, especially considering some of the authors didn’t see their own view as being objectively Biblical! A chapter attempting to defend a non-denominational model could have been worthwhile addition. Does this book succeed? It depends what you want from it. If you want to read authors all arguing for their position from Scripture, this may not be the best book to buy. However, this is never promised in the book internally so I can’t criticise it too strongly on this basis. I can’t fault a book for not meeting an un-promised goal that I wanted. Since I feel that the contributions could have been stronger, I’m a little hesitant to endorse it wholeheartedly. If you want introductions to some of the key issues and positions, and how others would respond to these presentations, this book would be worth considering. Special thanks to Jim Baird and B&H Academic for providing a review copy of this book! Could God be rid of the Trinity?